What’s it like to BeMe? Scrolling down the Facbebook or Instagram newsfeed you see all these nice pictures and videos of beautiful and happy people going out for dinner at fancy restaurants with their lover or travelling around the world with their friends. Everyone and everything they do, looks and sounds just good. You barley see things posted online that are showing you having a hangover breakfast looking overtired and eating crappy food. As social media became the platform where people are presenting themselves to a community, it also became a platform where you mostly see peoples live in the best way. Some have called this phenomenon the rise of the curated self. In order to accomplish that people are editing their content until it is in their eyes presentable, most of social media apps offer several kinds of tools making it easy for the user to adapt their content just the way they are aiming for. However since July 2015 we have a new rising star of social media apps that wants to revolute exactly this pressure to have your life look like a fairytale: Beme. This new social app, was now designed in order to head for another direction. Beme is a video-sharing platform founded by Casey Neistat and the former head of engineering at Tumblr, Matt Hackett. The concept is similar to the popular app Snapchat, you share something that can be seen once then disappears and may not be played again. With Beme the main difference is the way you record and then send the video. As explained in the video in order to record a clip you have to hold your phone against your chest or something that will cover it up. By doing that the app starts recording and after four seconds it stops. For that the app uses an interactional design making the iPhone’s proximity sensor to fulfil the function of the record button. So there are simply no buttons to press in order to record. While capturing the moment the screen of your phone goes completely black. Starting and finishing point are both signalized by a beep. After the finishing beep appears the video automatically gets posted. That’s it. And Now: the Beme community will have your video on their news feed. No watching before posting, no editing and no retake. You have just sent a video of your life situation exactly as it was. This is exactly what Neistat wants people to do: start sharing real and authentic content again. The way Beme works it eliminates the possibility to design or even review our shot before sharing. Thereby the real version of that moment will be uploaded and not the bolstered one. 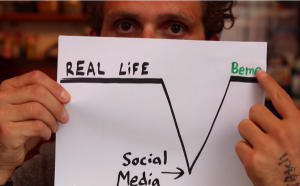 In that Neistat sees the main reason social media is built to. Share with the world a version of who we really are. But he does not only wants to fight the edited profiling constructed by social media but also aims to open up peoples mind for reality again. Instead of holding a phone between you and your subject you are now able to watch the situation you are filming naturally (and not through your phone) and recording it at once. As the screen goes black during the time you are recording Beme wants you to set your focus elsewhere. So Beme is not only giving social media more reality but also lets you keep your eyes more on the world. This concept goes through the whole app as itself as even the reaction you are sending are not illustrated by some emoticon or a like thumb but by real reaction, that are made with the front camera while watching the video. Already many articles discuss the apps’ aim and how, or even whether, it will affect the way people are using social media today. Most of them are questioning whether authenticy is received as lame and simply not entertaining enough to take over the social media platforms. Besides that I am asking myself whether this medium is really completely authentic. Is this really the way of making a movement towards authentic sharing? Considering that you open the app and make the recording with the knowledge that it will be shared you could say that it still offers you the possibility of presenting yourself in a certain way. Nevertheless I think it is emergent that someone is doing the first step against this social media pressure on people which ends in them filtering their lives to death and pretending to be something they are not. Whether it will have a lasting impact remains to be seen. Maybe this app itself will not change the world, but the fact that they spreaded a usage of the camera that makes it able to capture something without looking through your phone – could be a great start after all in making a step forward and living in reality again and at the same time capturing a real moment. 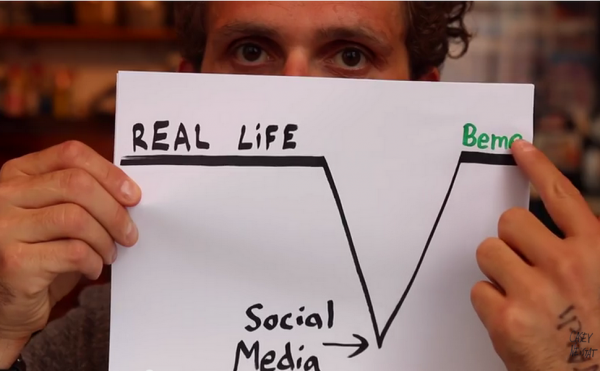 Beme: Will Authenticity Form New Aesthetics?